Classes that give information about pregnancy, labour/delivery and caring for the baby. This is a kind of depression that happens during pregnancy, some women feel down, sad, anxious. Appointments at your maternity hospital during your pregnancy where the doctor makes sure you and your baby are okay. You might get ultrasounds or blood tests at these appointments. This is normal for the first few weeks where a woman feels down or a bit emotional. If this lasts longer than 2 weeks, talk to your GP/midwife or Traveller Community Health Worker. A C-section is an operation. You will be awake but the bottom half of your body will be numb so you won’t feel any pain. Some women have C-sections for different reasons, including if the baby is breach. The hospital will decide whether or not you need a C-section. Checks for cervical cancer. All women between 25-60 are entitled to a free smear test every 3 years. You can get on the register for this service online at www.cervicalcheck.ie, by phone 1800 45 45 55, or by contacting your local Traveller organisation. If you are registered, you can wait three months after giving birth to have your smear test. If your last smear test result was not normal and you are pregnant when your next smear test is due, you can have a smear test during pregnancy. Galactosaemia is a medical condition where the baby can’t process the milk. Babies with Galactosaemia can’t drink the normal formula milk and need to go on a special soy feed. This condition is higher in Travellers and so all Traveller babies are tested when they are born and are given a soy feed until the test comes back clear. This is why it is really important to make sure that you answer the ethnic question at the booking appointment as the hospital can make sure they test your baby and give them the right feed. If you plan on breastfeeding your baby, tell your nurse beforehand and they can try to speed up the results and help you express your milk. A pregnancy where the baby grows outside of the womb—most of the time in the fallopian tubes—because the egg fertilised before reaching the womb. A condition that happens to a baby when a mother drinks during pregnancy. This can affect the baby’s growth and their features, it can also affect they’re learning and behaviour later on. 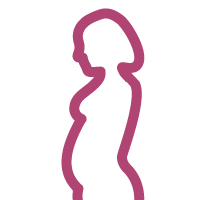 This is diabetes during pregnancy and happens when the body can’t make enough insulin, so it might make you feel more weak or sick. It usually goes away after the baby is born. Pregnancies that need more support and more appointments. When a woman loses her baby before the 20 week mark in her pregnancy. This is a very rare and serious condition that affects some women very quickly after having a baby. Women with this condition can be very depressed, anxious and see things that aren’t real. It is very important that a woman who might have this condition gets medical help immediately. Premature birth is when a child is born more than three weeks before the due date. It does not give the baby enough time to mature in the womb. When a baby dies in the womb after the mother has been pregnant for 24 weeks or longer. When a baby under 1 dies suddenly without any reason, usually when they are sleeping. This where you have high blood pressure usually after 20 weeks of pregnancy. Your face, feet and hands will swell and the only cure is labour. Doctors break up your pregnancy into 3 different stages, they are called trimesters.